Grace Mai and Thuy Loi wanted a roomy house close to DC. The couple, recently married and expecting a child, found a townhouse in Rosslyn a short walk from Key Bridge. It suited them for size and location, but the choice surprised friends and family. The pseudo-Colonial interior didn’t fit their image as urbanites seeking to blend Taiwanese and Vietnamese-Chinese ancestries with a modernist sensibility. 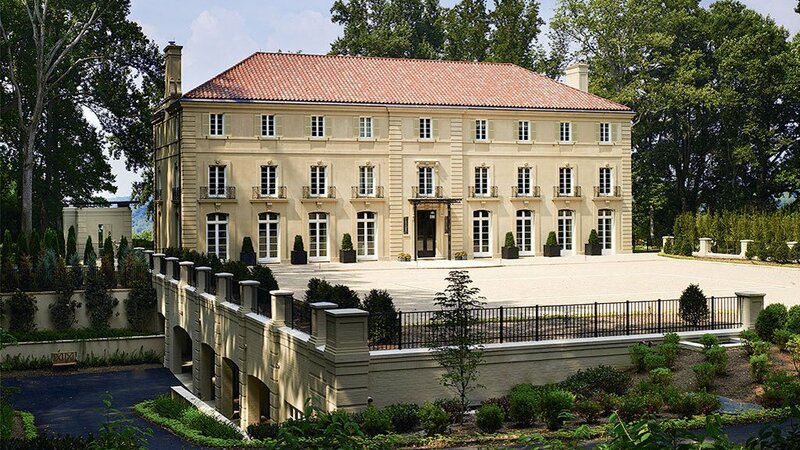 They asked architect Andreas Charalambous of Forma Design in DC for help. Known for a minimalist modern style, Charalambous stripped the interior to its essentials. He took out walls from the main floor, flooding the interior with light and creating one continuous space from front to back for the kitchen, dining room, and living room. Throughout the house, light oak floors were stained a dark ebony. On the main floor and in the third-floor bedrooms, one wall is painted Chinese red, a symbol for good luck. The accent color in the master bedroom is a quieter olive green. The traditional Asian color palette sets the stage for sleek furniture and cabinetry. 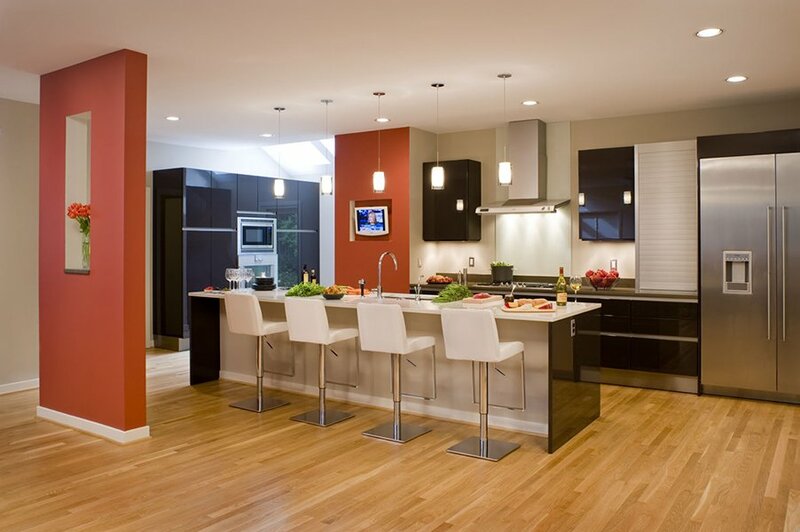 Bright white kitchen wall cabinets stand out against the red wall and ebony floor. In the master bedroom, an odd arrangement of bookcases and closets was stripped away and replaced with a long wall of sycamore-veneer-paneled cabinets that enclose a fireplace, storage, and flat-panel TV. On the opposite wall, floor-to-ceiling closet doors blend into a neutral white wall. A Japanese sensibility prevails in the master bath. The previously dark space is brightened with white surfaces, and a once-claustrophobic toilet room is enclosed in frosted glass, preserving privacy while admitting light. The design achieves a balance between yin and yang—traditional yet modern, sleek but not stark, both stimulating and comfortable. Seventeen-month-old son Rowan will know exactly who he is—an American of Asian descent living in a modern world.